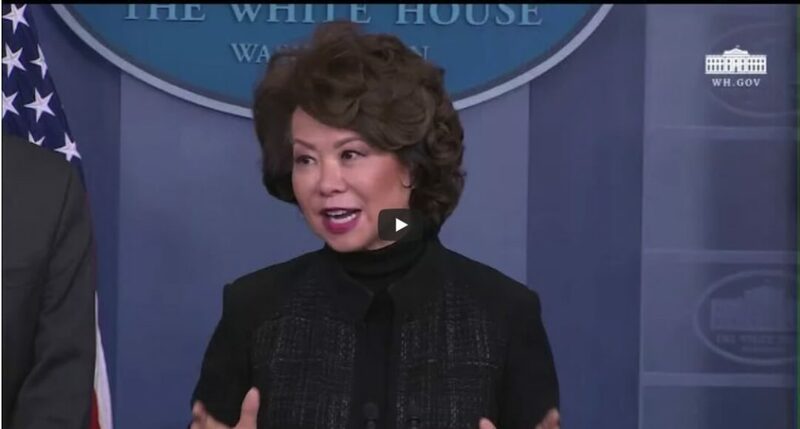 Transportation Secretary Elaine Chao (the wife of Senator Mitch McConnell) was recently asked if taxes would have to increase for the government to be able to work on our nation’s infrastructure. While not admitting that taxes WOULD go up, the Secretary did say that it could be a likely course of action because “there is not enough money in the world to pay for all the infrastructure” that we need. Question: So you’re saying taxes will increase, and tolls will increase, or they won’t? Elaine Chao: That is a decision that is up to the state and local governments, and also, it is going to depend [on whether we implement] a federal gas tax. These are hard decisions. We all want better infrastructure, but unfortunately, there is just not enough money in the world to pay for all the infrastructure. Which is why the president’s infrastructure plan also emphasizes the private sector. Private sector pension funds are a tremendous source of capital for funding public infrastructure. There are states which disallow the private sector from investing in public infrastructure. So we hope that those restrictions can be removed. And then those states and localities that want to work with the private sector, it is their decision whether they want to use private… funds, tolls, whatever. What we are saying in this proposal is we are looking at creative ways for financing, and so tolls is one way, we’re not advocating for them or endorsing them. It is really up to the local entities that are involved.